Using the barren desert as an artistic and aesthetic backdrop for a mythical tale of… well, many things (but we’ll get to that in a bit)Â poet/filmmaker Nacer Khemir’s first film (and the first in his recently completed Desert Trilogy) involves many characters, many stories, and many long shots of the windswept desert. Released in 1984, the subsequent entries in the trilogy (The Dove’s Lost Necklace Â and Bab’Aziz)Â are also set in theÂ desert, leading Khemir toÂ state thatÂ “In all of my threeÂ movies, the desert is a character in itself.”Â While the colors are vibrant and there are occasional hints of poeticism in the dialogue, whether or not the film as a whole is coherent to the typical Western viewer is another question entirely. From the beginning, the audience is thrown into the story with little information or introduction to the world of the film. Following a school teacher’s bus ride to a mysterious new assignment, we enter a small, rather unusualÂ desert town. But for a town with so few residents and such little action, there’s a lot going on, and not all of it is easy to follow. There are the young boys who roam the streets, seeking to break all mirrors in the town in order to build a garden, the man (genie? spirit?) abiding inÂ a well, the old man who has been scouring the hills for treasure for decades, and then, and most importantly, there are the “wanderers.” This group of men seems to be the focus of the film (as they do constitute the film’s title), but in the end little is made of them. When they reach a certain age, they dream of a mythical creature and then wander into the desert to join the roving pack and never return. The school teacher works to uncover more information and just when it seems that the story is reaching a peak, he disappears and a new story, involving a ship (declared to belong to Sinbad) appears in the desert.Â As if the teacher’s disappearance weren’t confusing enough, aÂ state officer appears to investigate the ship. Khemir attempts toÂ endow his characters withÂ life and wit, but mostly confusion abounds. If this film were divided into several short films, perhaps a series of episodes of eerie occurances in a small Middle Eastern town, it may have heldÂ more weight. As it stands, it still feels like several short films stuck together rather than one continuous narrative. Those looking to expand their cultural horizons may find something to enjoy here – the landscapes and clothing are interesting enough – but others will be put off by the lack of a cohesive narrative. 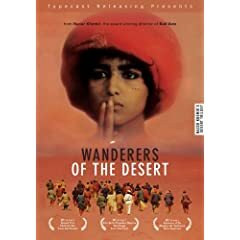 2 users commented in " DVD Review: Wanderers of the Desert "
I liked “Wanderers of the Desert.” Granted it was a little challenging but IMO well worth the effort. It’s ironic that the two previous reviews seem to examine the plot logically while the police officer in the film was tripped up because he tried to do the same thing. He tried to make sense of events and motives using Logic. The school teacher tried that, too, but eventually was overcome by the mysticism of the place. The scribe had the sensibility of a poet and so fell in with the spirituality of the place.